We've worked for well over one year to try and offer the most natural looking pink diamond simulant available and are proud to show the results of our efforts. Combining a stunning pink color along with our highly regarded diamond-infusion process, the result is a pink that sparkles with life and rich color. 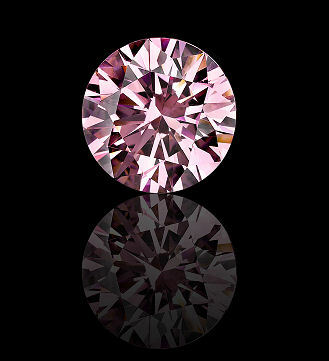 A note about Natural pink diamonds: Natural pink diamonds are among the most treasured of colored diamonds, and fancy intense/vivid pink diamonds readily command prices in excess of $100,000 per carat. Just something to keep in mind if you are not planning to reveal the source of your new 'pink diamond'. Please note that this page is for our Asha Diamond Simulant pink rounds. For true lab grown pink diamonds, please see our Takara website here. In keeping with the natural diamond look for our simulated pink diamond Asha, we are cutting these to near-ideal round brilliant cuts rather than H&A rounds. The reason for this is that almost all natural fancy cut diamonds are cut to less perfect proportions (slightly deeper) to enhance the color of the diamond, and so we've stayed true to that with our pink Asha rounds. Fast shipping: Our fancy pink rounds ship in diamond paper packaging, and usually ship within 48 hours of your order. We will email you the UPS tracking number when it ships, and 2 day UPS shipping is free for orders over $200.